After MCI had pointed out certain deficiencies with the pace of work at the Doon medical college, MCI has given one more chance to college authorities to overcome those deficiencies. The Principal of the DMC, Dr Pradeep Bharati Gupta has further confirmed the news and has implied that the college has received a letter from MCI granting it time for compliance verification. He further implied on his statement that certain deficiencies in the faculty, hospital, and equipment will now be taken care of, with an appropriate action plan. 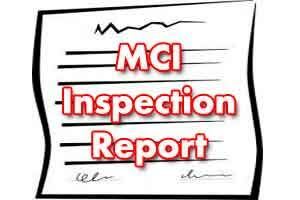 The letter of MCI has pointed out some deficiencies in the department of Anatomy, Physiology and Biochemistry. MCI has also expressed dissatisfaction with the shortage in laboratory facility and other equipments of DMC. After completion of this one month, the DMC plans to send a response to the MCI clearly stating the measures implemented to rectify the deficiencies pointed by the apex body. After which, MCI is expected to take a decision on the next inspection visit to grant permission to the college. At the time of MCI visit last month the college had only 50 faculty members on its roll which now have increased to 80 similarly at that time the Doon hospital and Doon women hospital was not transferred to the Medical College which is now done. The DMC is coming up different locations of the city. The erstwhile Doon hospital and Doon women hospital are now part of DMC. A multi story Out Patient Department (OPD) of the Medical College is being constructed near Tehsil Chowk in the city. The administrative and academic buildings of the college are constructed at Dehra Khas area located in Patel Nagar.